This hanging calling card holder is a rare example of American school girl artistry at its finest. 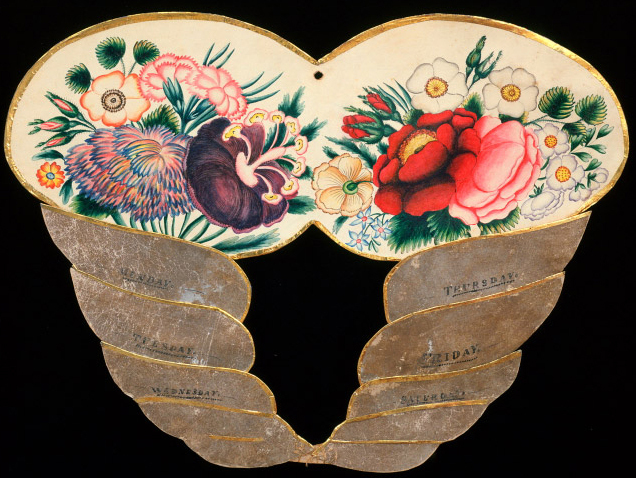 It is composed of cut and sewn paperboard in the shape of two inter-connecting flower-filled cornucopia, with ink and water colored designs. A most unusual feature is the varnished silver foil used for the horns which would have originally imitated a gilt surface. These have layered individual pockets designated for and inscribed in ink with the days of the week, “Monday,” “Tuesday,” “Wednesday,” “Thursday,” Friday,” and Saturday. The whole with applied gold foil borders. Although calling card holders of this type are occasionally seen, the complexity and high degree of artistic merit employed in this example make it a best of kind.